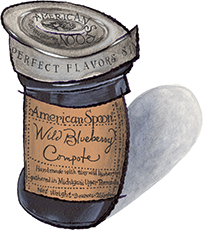 Wild Blueberry Compote from Northern Michigan for sale. Buy online at Zingerman's Mail Order. Gourmet Gifts. Food Gifts. Once when I visited American Spoon, Justin Rashid's unparalled preserve company in northern Michigan, I noticed some crates of wild blueberries. "What are those?" I asked. Noah, his son, told me, "Those are special. Forget you ever saw them." I didn't. I had an inkling something delicious was afoot. Instead I pressed and pressed until he agreed to let me taste some of the wild blueberry jam they were making. There was a reason Noah was reluctant. To say the supply is low is an understatement. The supplier is one man. He forages in the Hiawatha National Forest in Michigan's Upper Peninsula. The berries aren't the marble-sized fruit you see at the farmer's market, they're the size of a small pea. The lone picker works the season—just two weeks in August—selecting ripe berries from knee-high bushes. He loads the berries into his minivan every couple days and drives them across the Mackinac Bridge to American Spoon. The crew at American Spoon cook the whole berries with cane sugar for what, in the preserve-making world, is a very short time. The result isn't a jam per se but a pourable, spoonable compote. The fresh, bright flavor of these little wild beauties comes through loud and clear. Try some with waffles, pancakes, cheesecakes, morning toast or even atop a grilled pork chop. There are few jams made from this level of fruit with this careful of a process anywhere. A great gift for blueberry fans or jam afficianados.